I enjoyed this read very much. Such a happy ending. Vivid, fast-paced, easier to read in comparison to Austen's other novels. 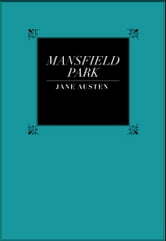 Mansfield Park seems to be a more apparent mash up of many of Austen's conflicting themes about women, men, sexuality, family, duty, independence, liberty and virtue. If you're expecting socially aware text of the slave trade and the exploitation of the working classes. You wont find much. But Mansfield Park is brilliant in its ability to expose the hypocrisy of charity, the condescension of helping others up without treating them as your equal or the futility of assistance without consulting or thinking of a persons actual needs and feelings. In Fanny's physical weakness and belated self-sufficiency, it also illustrates the danger of creating dependency rather than empowerment. At the same time, this is a fantastic illustration of classism, as Austen reveals her partiality for middle-class principles while maintaining a particular regard for the upper-classes. Illuminating and though-provoking, Mansfield Park speaks for sincerity, ethics and wisdom in a world where appearances are everything. Loved this novel by Jane Austen and the humble heroine created by her. Fanny definitely grows on you and you find yourself cheering for her and glad for her well deserved happy ending. Most characters in this novel are engaging and a few, like Fanny, will win your heart and esteem. An entertaining book filled with lessons based on character and judgement. Took me awhile to finish but all's worth as the story ended nicely. Good read on conduct, godly values and principles.